← It Was 20 Years Ago Today – Really! That was the headline that draped the June 6, 1985 issue of Rolling Stone Magazine when they featured a cover article on John’s son Julian, who, back then, was breaking into the music business with rave reviews of his first album, “Valotte”, that featured haunting vocals reminiscent of his late father, who had only been gone for five years. Well, on a week that is traditionally sad for Lennon fans, a white feather has landed, inviting art lovers to celebrate Julian’s photography on display at Overture Contemporary Art Fair going on through Sunday December 9th in the Wynwood section of Miami, the newest, hippest, trendiest “must be seen at” artsy-fartsy section of Miami. Julian is in town for a photograph and a smile, a dozen or so actually, hung on the wall of the temporary gallery at Overture. Julian will chat, smile, sign and be more than happy to sell you a framed photograph or a numbered print. Beatle Brunch Host Joe Johnson spent some time with Julian on Tuesday to talk about his photographs, his new (upcoming) CD “Everything Changes”, his dad and his favorite charity, and how they’re related. Julian told Joe that one of the reasons he loves photography so much is because it’s one area where he can’t be compared to his father. Julian’s charity of choice is The White Feather Foundation, one he came up with that embraces environmental and humanitarian issues throughout the world, with an heavy emphasis on water conservation and purification, particularly in the poorer sections of the world. Julian also sings on a track from the new Aerosmith CD “Music From Another Dimension”. When Joe mentioned they were playing locally Sunday night, the night Julian’s exhibit closes, there were raised eyebrows, thinking the “Son” might like to shine at a guest appearance at the show. Sadly, though, Sunday also marks the 32nd anniversary of the day John Lennon was taken from us, so his showing is highly unlikely, understandably so. Read more about Julian’s causes, his photography, his music and his long time friend Lucy, who passed away in 2009 from Lupus, a charity that Julian also embraces. 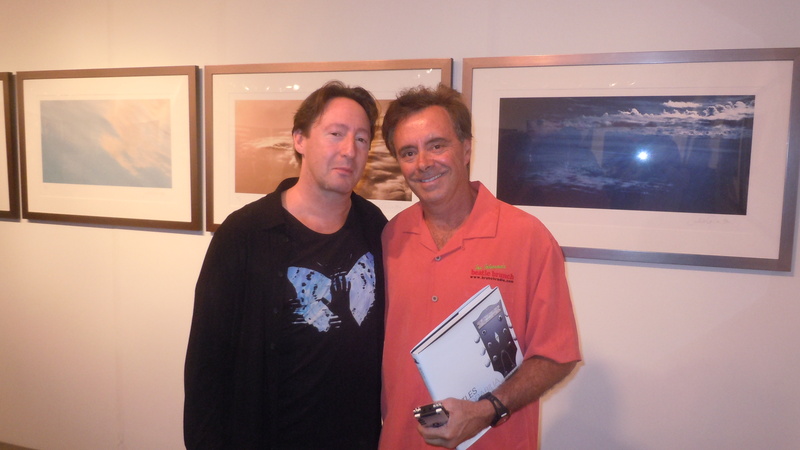 Go to www.julianlennon.com and listen to Joe Johnson’s Beatle Brunch for excerpts from Joe’s interview with Julian. You’ll also be able to find the entire interview in the Beatle Brunch Club downloads section and a video in the After Brunch section of www.beatlebrunchclub.com. Members can hear each week’s show on demand and “Old Brown Shows”, Beatle Brunch Classics. This entry was posted in Uncategorized and tagged art exhibit, beatles, john, julian, lennon. Bookmark the permalink.